Shown below are free ads available in Property for sale, Winnipeg. You will find classifieds for sale and to buy. Please click a classified ad below for more details or to reply to it. You can use search box above to find other items for sale or services offerings in category Property for sale in Winnipeg or look in the Winnipeg neighborhood. Commercial C2 Lot FOR SALE on Portage Avenue, between Roseberry and Collegiate Street in Winnipeg, Manitoba. Excellent location offers great exposure for business and heavy-drive by traffic. Design, blue prints and permit for 7000sq with parking are available. Temporary Power on site. 66 x 120 C2 Lot space. 160 acres (approx 125 acres of good , grain producing land.) Main house and mobile home on property with barn, machine shed and tool sheds. Unlimited potable water supply from deep well, a small private lake with excellent migratory game bird hunting and water sports. Well maintained yard site with lots of natural shelter and beauty near Sandy Lake, Manitoba. 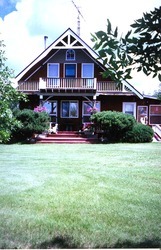 This immaculate 1 1/2 storey home (A-frame Chalet) includes 160 acres. It is located just minutes from the Lake of the Prairies/Asessippi Ski Hill. The home is 1800 square feet, with three bedrooms and two bathrooms (one 4-piece, one 3-piece). Price includes stove, two fridges, dishwasher, two freezers, stackable washer/drier. Cozy, comfortably located bungalow. A very good value for a solid home on a quiet street close to playgrounds, parks, central public transit, shopping (Uni-city mall), and schools (high, middle, and elementary schools). This home has undergone many improvements, including: new laminate flooring, finished basement, new windows, and a renovated kitchen. House and apartment Painting at a fair price. 15yrs exp. Free est. Call Dean 293-8353. We are insured. Paintover.ca. Address 1280 Spruce St, Winnipeg, MB, Canada Bedrooms (#) 2 bedrooms Bathrooms (#) 1 bathroom This bright and open 765 square foot bungalow has two bedrooms, one bathroom, and features beautiful original hardwoods throughout the main floor. It's great starter home on a quiet, elm-lined street close to Polo Park, Clifton elementary and Tech Voc, Clifton Community Centre, and the new Cindy Klassen recreation centre. Dont pay a builder big dollars to do what our company can do for you at a fraction of the cost. Building does not have to be expensive. Free consult. call 480-0778 for an appointment..
Price Reduced! Welcome to 628 Furby Street in the West End of Winnipeg. This 1835 square foot 2 ½ storey family home features 5 total bedrooms and 2 full bathrooms and has been lovingly cared for and updated by the current long term owners. This lovely character home was built in 1905 and is situated on a 25 x 119 foot landscaped lot, and is fully fenced with tons of room for a growing family. Great first home at affordable price; can be great revenue property with 3 good-sized bedrooms, large lot, spacious partial basement with facilities for laundry hook-up; newer roof, copper plumbing, some newer windows; located among other well-kept homes in the area, shows well; great home for the price. Winnipeg 3BR 1BA, This is a great Fort Rouge 2 story home. This is a great Fort Rouge 2 story home. It was completely renovated in 2006 but still retains much of it's original character. Very good location only blocks from shopping, schools and transportation. This bright and sunny home features new windows and doors, ceramic tile floors in the kitchen, front entry and bath, beautiful hardwoods in the living room and dining room and granite counter tops and back-splash in the new kitchen. LARGE 2000 SQ.FT. BUNG. On 4 park like acres inside Olds town limits fronting on 2A Hwy & designated highway commercial. $650, 000, terms available. Walter Bartel Coldwell Banker 1-204-999-6581. Three suites, separate meters for heat, water, hydro; rents are $575, $575, and $650 and tenants pay all utilities; excellent location. Listing Agent: Michael Monchka. No gas heating bills to pay. Both suites are heated by electric baseboard heaters and tenants have separate hydro meters so tenants pay heat and hydro. Landlord only pays for water, insurance, taxes, mortgage. Great cash flow - one tenant presently paying $700 plus electricity; second suite has just been re-decorated (new windows, carpets, flooring, cabinet repairs, etc. Showings start December 15th, offers presented Dec 21st, 6:00pm. Nice starter home on Lyndale Drive. Living room/den combination with large windows to let in the natural light. Laminate hardwoods. 3 Bedrooms. Eat-in kitchen. High ceilings. Updated main fl. Forclosure home, this must be sold. Very Spacious 1632 sf origional 1/2 Storey home with Large two storey addition with full finished basement. Three Large bedrooms, one bedroom is loft style. 2 full bathrooms, along with a 2 piece bathroom in the master bedroom. Exceptionally Large eat in kitchen, along with dining room. Have you ever thought about starting your own business? With our instant business packages, you can have your business up and running with an image of professionalism practically overnight! Our packages are designed with entrepreneurs in mind. Basic Mailing Service - Mail receiving and holding, A real street address, not a P.
Absolutely Gorgeous Home ! , With Fantastic Renovations! Offering 3 Bedrooms, Two Bathrooms, Recroom , Main Floor Laundry and Double Car Garage. Main Floor has a Eat-in-Kitchen, Spacious Living Room, Bedroom or Dining Room, 4 pIece Bathroom and Main Floor Laundry. The Upper Level has two Spacious Bedrooms and the full Basement is Insulated with a Lovely Recroom area and a Three Piece Bathroom. Nicely decorated and waiting for you! Bright kitchen with newer flooring counters. Wonderful combination living-dining room with laminates designer paint scheme. Finished basement boasts awesome recroom with thndal stone fireplace, 3rd bedroom, 2nd full bath of storage. Fridge included. Fast possession available. EXCELLENT REVENUE PROPERTY FOR ONLY $ 59, 900. DUPLEX WITH 3 BEDROOM SUITE IN THE BACK AND 1 BEDROOM SUITE IN THE FRONT. TOTAL GROSS INCOME IS $ 12900 / YEARLY. LIVE IN ONE SUITE AND LET THE TENANTS PAY YOUR MORTGAGE OR JUST KEEP IT AS AN INVESTMENT PROPERTY. Listing Agent: AMAN RAI. SOLID ORIGINAL OWNER HOME IS WAITING FOR YOUR PERSONAL DECORATING IDEAS! THIS 1044, 3 BDR HOME HAS OAK HARDWOOD FLOORS THRU OUT, A PARTLY FINISHED BASEMENT WITH DRY BAR! LARGE FENCED LOT WITH ASHPHALT PAD AND ROOM FOR 4 CARS! PLENTY OF ROOM TO BUILD A GAR. TECHNICAL DETAILS: LOCATION City: Winnipeg Area: Transcona Neighbourhood: Transcona ROOM DIMENSIONS Bedroom 1 (Master): 10'10" x 11'1" Bedroom 2: 8' x 11' Bedroom 3: 7'4" x 11' Dining Room: 11' x 8'6" Kitchen: 7'2" x 8'2" Living Room: 12' x 15'11" LL Recreation Room: 18' x 24' Storage/Utility: 10'2" x 10'8" TECHNICALS Apprx. A Gorgeous Starter Home on a Quiet Tree Lined Street. Many recent upgrades including a New High Efficiency Furnace in 02, Hot Water Tank in 02, Central Air in 02, Roof Shingles in 04, Painted Throughout in 09 (Except for Master Bedroom) and the Kitchen Flooring was done in the summer of 09. This 1, 110 Sq. Vendor motivated. Upgrades include: high efficiency furnace, electrical panel, some windows, vinyl siding, shingles, eaves, sewer, new insulated garage with 9' ceiling and 220v service, new hot water tank, some flooring. Flexible possession. THIS SPACIOUS CUSTOM BUILT GINO'S HOME IS READY FOR YOU! ORIGINAL OWNERS BUILT THIS 4 BEDROOM BEAUTY WITH SOARING VAULTED CLGS & NEUTRAL DECOR THRU OUT! LARGE OPEN LIVING ROOM HAS ELEGANT GAS FIRE PLACE AND BRIGHT WEST EXPOSURE! THE COMBO DINING ROOM FEAT. Welcome to 267 Wallie Road in the desirable and quiet setting of St. Clements. This 2300 square foot 2-storey family home features 6 total bedrooms and 2.5 bathrooms and has been lovingly cared for and updated with all the amenities. This fantastic home was built in 1996 and is situated on 4.1 acres of mature landscaped grounds, and is fully fenced with tons of room for a growing family. A Rare Find ! in a Highly Desirable Area ! Great Location!, Great Neighborhood !, West of Mcphillips Street! Well Maintained Home, Same Owner for Over 30 Years!. This Home has Good Mechanics but has its original Decor. With Some Cosmetic Upgrades this Home would be Gorgeous! and Well Worth it!. Offering 3 Bedrooms, Eat-in-Kitchen, Living Room/Dining Room Combination, some Oak Hardwood Floors, Recroom with extra Bedroom or Office and Double Car Garage. This well maintained 2 br home has a large open living room/dining room, updated bath with jetted tub and a recently renovated kitchen. Great central location close to many amenities. Call for your appointment today 453-7653..
Canada free classified ads for Property for sale, Winnipeg, Property for sale free ads Winnipeg, Property for sale for sale Winnipeg, Property for sale to buy in Winnipeg. This page is a search result of classified ads for Property for sale category in Winnipeg. This listing includes classifieds for sale and to buy in Winnipeg. If you posted an ad on Property for sale, Winnipeg before please use Edit my ads button to change or cancel your advertisement. Property for sale Winnipeg ads Winnipeg, Property for sale classifieds Winnipeg, Property for sale free ads Winnipeg, ads for sale Winnipeg, ads to buy Winnipeg, FREEADS in Canada. Find here ads for sale, to buy and rent in Winnipeg. Goods for sale in Winnipeg, vehicles for sale in Winnipeg, Winnipeg real estate for sale, Winnipeg property for sale, property for rent in Winnipeg, business ads in Winnipeg, Winnipeg business classifieds, services in Winnipeg, Winnipeg services ads, jobs in Winnipeg, pets for sale in Winnipeg, Winnipeg dating, Winnipeg cars for sale.